"Crepidula Fornicata ". 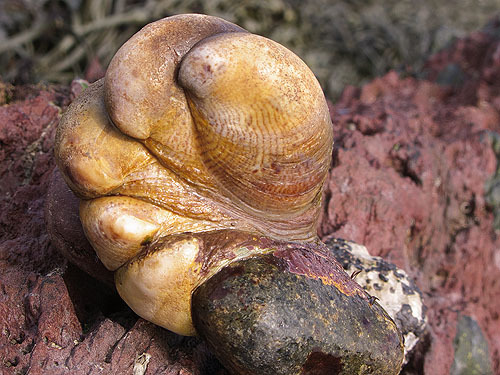 Slipper limpets are commonly found in curved chains formed of many animals. Large shells are found at the bottom of the chain, with the shells becoming progressively smaller towards the top. Typically found attached to shells and stones on soft substrata around the low water mark . The female is at the bottom of the chain , those on top are male , when the female dies the male nearest the bottom changes to female. A non-native species , introduced to Essex between 1887 and 1890 in association with Oysters from America. The native Oyster may have declined as the Slipper Limpet out competes it for food and living space. Near Musselwick Point - Dale.